#1. Gerry Blakes (6'4''-G-93, played in 1923-24, plays pro in Italy) led MIA-RO Cantu to a victory against the closely-ranked Dolomiti En. TR (7-10) 97-92 in the Italian Serie A in Sunday night's game. He scored 17 points, grabbed 5 rebounds and dished 3 assists in 26 minutes; quite an impressive performance considering it's only Blakes' third season in pro basketball. 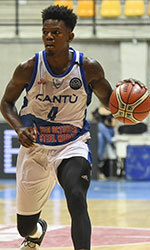 MIA-Red October Cantu (7-10) is placed 11th in the Serie A. Blakes has relatively good stats this year 11.4ppg, 3.2rpg and 2.7apg in 16 games he played so far. #2. Charles Callison (6'0''-PG-95, played in 2014-15, plays in Denmark) could not help Horsens IC (13-4) in their last game on Sunday. Despite Callison's very good performance the second-placed Horsens IC (13-4) was defeated 106-93 at home by the lower-ranked Randers (#5) in the ProA group. He was the second best scorer with 15 points. Callison also added 7 passes. It's Callison's first season with the team. He has individually a very good year with high stats. Callison averages 15.3ppg, 3.0rpg, 3.9apg and 1.9spg. #3. Kyle Benton (6'7''-F-95, played in 2014-15, currently in Spain) was not able to help Vic in their game against HLA Alicante (15-4) in the Spanish LEB Silver (third division). Benton recorded 6 points and added 3 assists in 20 minutes. The 12th-placed Vic (5-14) was crushed 101-80 on the road by the leading HLA Alicante in the East group. It was Vic's third consecutive loss in a row. There are only three games left until the end of the Regular Season. So now every game will be critical. Benton has relatively good stats this year 13.4ppg, 6.1rpg and 1.5apg in 15 games. #4. Lucas de Souza (6'11''-F-96, graduated '16, plays pro in Brazil) was not able to secure a victory for Basquete Joinville/AABJ in their game against Flamengo (14-4) in the Brazilian NBB. de Souza's contribution was not very remarkable in Thursday's game. He scored only 2 points. his team was crushed 89-50 in Rio de Janeiro by the second-ranked Flamengo. This season de Souza averages 2.9ppg and 2.3rpg. Notice: The list above includes only some of the San Bernardino Valley College alumni playing currently in pro basketball. Check COMPLETE LIST.